Silkmoths and faeries. Mermaids and mantas. Bluebirds and unicorns. Songs to give choirs wings! Fae By Nature Music presents enchanting choral works for Youth and Adult choirs by composer Diane Laura Rains. 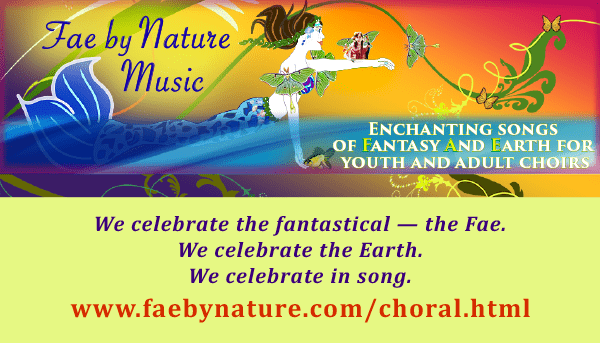 Lush, magical, yet very much of this Earth, every Fae By Nature choral composition not only delights the ear, but broadens humans’ understanding of our planet and its wild creatures. Our music sings of the delicate, exquisitely beautiful balance of nature. It sings of treasures hidden in plain view and of doors to other realms. Presented in thematic collections (Entomologica, Aviana, Neptune’s Keep, Earth Tapestries, and Faerie Realms), Fae By Nature digital PDF scores can be purchased in our Etsy Shop: www.etsy.com/shop/FaeByNature. We offer full Open Scores with all voices and instruments, as well as Reduced Scores for instrumental accompanists. We are also available to accompany your choir’s performance of Fae By Nature choral works on a variety of extraordinary instruments. Learn more about Fae By Nature and view our catalog at www.faebynature.com/choral.html. Visit our table at the 2018 Summer Dialogue Exhibit Fair. We’d love to meet you! To find us, look for Faerie Galene; she’s the one with wings! We celebrate the fantastical — the Fae. I work with Diane re her singing skills, singing solo songs that she has written–lyrics and music. Her songs have been inventive and expressive, and eventually I encouraged her to “try her hand” at composing choral music. I’ve been gobsmacked at the quality of her work. Her texts are about the natural world and I find her poetry to be very expressive. The music that she composes to surround her poetry is engaging and expressive. If you’re looking for good secular music for your choirs to sing…. Diane is just starting out in this gig; please do give her work a look&listen and imagine the education that your singers will experience about protecting and preserving the natural world in which we human beings live.